The radiator provides a path to transfer heat from the engine and transmission to the outside air. One of the most important parts of your car’s cooling system is the radiator. The radiator is a heat exchanger: Hot coolant from the engine flows into the radiator, where the heat is transferred to the fins through a process of conduction. Then that heat is released to the air through a process of convection. 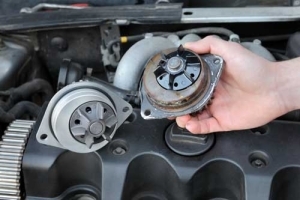 The newly cooled coolant then flows back into the engine, where it can absorb more heat and continue to keep your engine running at the proper temperature. The radiator on most cars also includes a transmission cooler. The cooler sits in one of the tanks, and hot transmission fluid flows through the cooler. The heat transfers to the coolant, which, in turn, releases it to the atmosphere. Today’s radiators are usually a combination of plastic tanks attached to an aluminum core. And since most engines are also aluminum, the combination has reduced or eliminated the problem caused by dissimilar metals. Your nearby Cottman center technicians are very familiar with the differences in today’s radiators. They have to tools and the skills necessary to check your car’s radiator and to repair or replace it if necessary. They’ll pressure test the system and check it for leaks, and they’ll examine the radiator core for damaged or missing fins. And, if necessary, they’ll replace the radiator with a new one that’s a perfect match for the original. So, if you’re experiencing problems with overheating or coolant leaks, give your local Cottman center a call. They’ll check your car’s radiator and get you back on the road… fast!